It’s not uncommon for a small rural church to feel isolated – like a ship on the open sea when there are no other ships in sight. But United Methodist churches are connected. They have less in common with the ship in that simile than they do with the streams and rivers that flow into the oceans that circle the world. This is the story of three small churches on the Maine coast that experienced that connection in a way that allowed them to receive support and, in turn, to offer it. 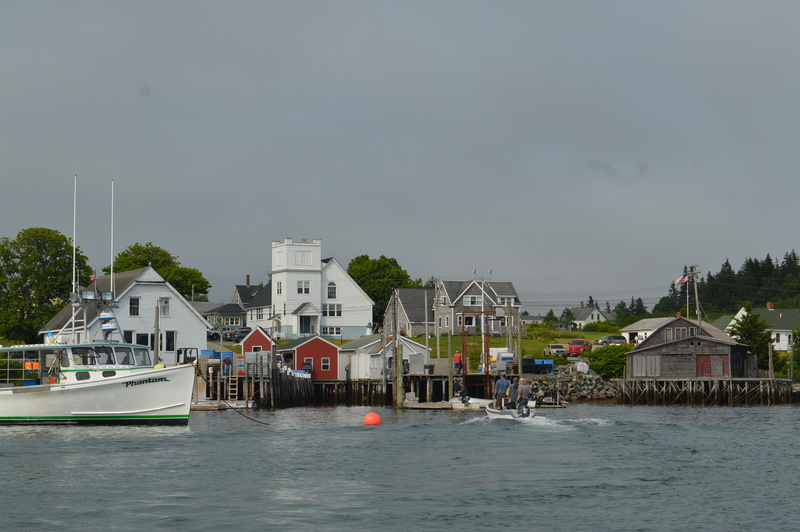 The harbor view from Cutler UMC would make a great “greetings from Maine” postcard. The church doors are always open. Tourists – this day two couples on a sailing trip – can stop by to use the restroom. A local woman who doesn’t have a phone knows she’s welcome to use the church’s for local calls. Jeremy, the lobster fisherman who lives in the house next door, keeps a watchful eye on the church. Cutler Pastor Sharon Stevens Grant said that she felt the spirit of the church before she started serving here (as lay supply beginning in 2016 and in 2018 as pastor). “It’s the people,” she said. The people number about a dozen in worship during the winter; it’s closer to 20 in summer. But even without the pews filled, years ago, this small congregation accepted their then-Pastor David Arruda’s challenge to give a portion of what they had to help another church. The church continues to tithe, and now their donations go to Arise, a faith-based program to combat drug addiction sponsored by Machias (ME) Christian Fellowship. Opioid addiction is a significant problem in Maine. “We need our Arise program badly,” Cutler members said. Arise is just the latest recipient of the church’s generosity. They have tithed to Pembroke (ME) UMC, and, before that, to North Perry UMC in Perry, ME. 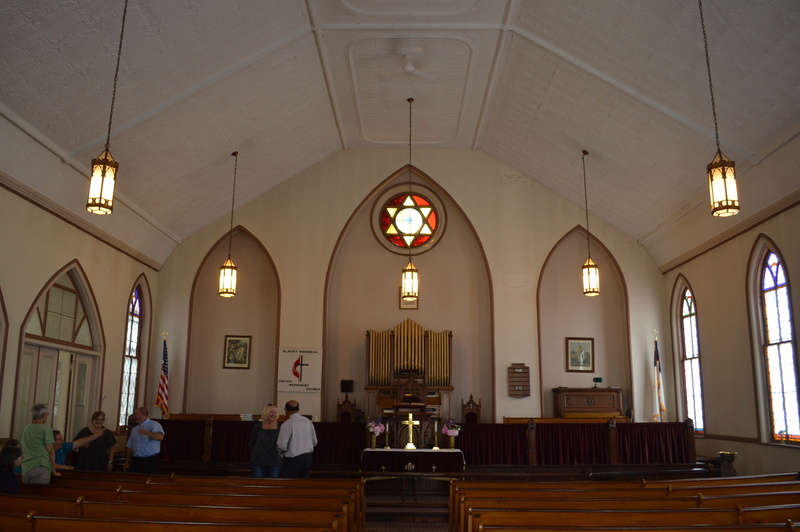 The doors – front and back – have definitely shaped the life of North Perry UMC. When the church was built in 1909, the two windows behind its altar faced the ocean (and what would become U.S. 1). In the 1930s, the church was lifted and turned 90 degrees so the doors would face the road. Unfortunately for the church, a new road came through (U.S. 1), and people driving by could no longer see the doors, just the back side of the church. new entrance – and a brand new steeple. Cutler UMC would play a role in this revitalization at North Perry, but when the church’s doors closed for the season after Christmas in 1999, they wouldn’t reopen again until 2003. In the meantime, local pastor Betty Palmer would pass North Perry UMC as she traveled Route 1. “She noticed it sitting here, and obviously empty, and she would pull up in behind and – unbeknownst to any of us – she would stand on this back doorstep, put her hand on the door, and pray for this church – all by herself; she asked God to be with this church,” Raye said. Raye grew up in North Perry UMC, but had lived away from Maine for many years. He and his wife returned in 2001, and found that “everyone still wanted to go here; it still felt like a church,” so the Rayes, along with other members of the church, asked the district superintendent to consider appointing a pastor. The church reopened Easter Sunday 2003, and has been open as a year-round church ever since. Summer worship attendance averages around 40, and drops by 10 or so during the winter. It was at that point, when North Perry was trying to shore up the building and get on its feet, that Cutler started sending a check every month from their offering; it continued for a couple of years. Raye said when he recently heard someone refer to one church coming alongside another, he thought of Cutler. 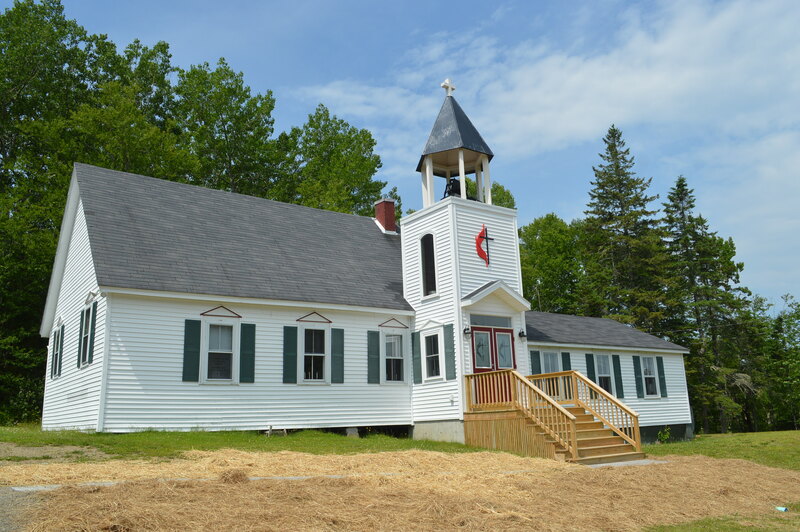 In the spring of 2017 there was no pastor in the pulpit and, often times, just two people in the pews on a Sunday at Blakey Memorial UMC in Eastport, ME. It’s not surprising to learn that the congregation voted to close the church. And that’s what would have happened if not for North Perry coming alongside. Raye wrote to Northern Maine District Superintendent Jackie Brannen, who shared the letter with the bishop and cabinet. They agreed not to approve the closure – if North Perry would step up to help. In November 2017, they began by taking turns preaching so there would be a service every Sunday. On July 1, 2018, Pastor Nick Guay’s first Sunday at Blakey, he accepted a check for $1,200 – $100 a month for the year – from the congregation at North Perry. “It’s a big deal for them – and a big deal for us, too,” Raye said. On the day the bishop visited Blakey, the doors were open; people wandered in and out as a rummage sale – complete with homemade whoopie pies (a Maine staple) – was wrapping up. “A lot of people in this community, even if they’ve moved away, have roots here: They were married here, or somebody was buried here or baptized here, and they haven’t forgotten,” Ftorek said. In fact, on July 21, 2018, a woman whose grandparents were married in Blakey Memorial by Ftorek’s father, the late Rev. Roland Chaffey, was married in the church, which also hosted the wedding reception. “Thanks for sharing this story,” Bishop Devadhar said after hearing from the folks at Blakey. “This is where the partnership between the laity and the clergy becomes stronger. You nudged us – through the power of the Holy Spirit – to listen to you and your dreams. If you had not stepped in, Kevin, on behalf of the saints of the church and said, ‘Don’t close this; we have a plan.’ We’d have closed that church. But thank you for saving not only the church but the souls in the community. We are in this ministry together. Maine Lobster from New England Conference UMC on Vimeo.